If you use Mac OS, you certainly have known about or used Time machine. It is a backup software application distributed with the Apple’s Mac OS X. It is used to backup your data to an external drive, so that you can restore them later from the backup. If you are a fan boy/girl of Time Machine, you need to check out “Cronopete”. It is the clone of Time Machine for Linux operating systems. Using Cronopete, we can easily create periodic backups of a Linux system. It supports popular Linux distributions, including Arch Linux, Debian, Fedora, and Ubuntu. 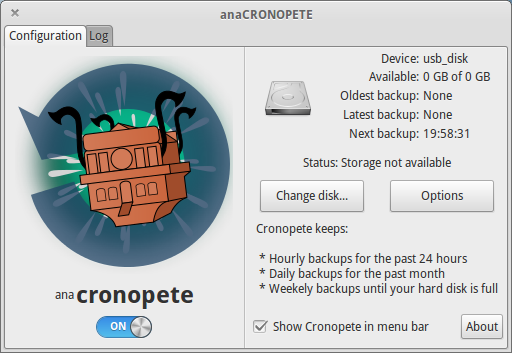 In this brief guide, we are going to see how to install and use Cronopete in Linux to backup and restore data. Rsync and SSH tools on different Linux port to copy local as well as remote files. Backup important data to secure place with Rsync and SSH in Linux. Linux shows you no mercy when you don’t have a backup. There are several backup utilities out there, including System Restore for Windows and Time Machine for Mac OS. Timeshift is an open-source software which takes incremental snapshots of your Linux file system at regular intervals, which you can restore later if you accidentally render your system unusable. Want to make sure your data and files are protected on your hard drive? Here are four great ways you can back up your hard drive on the Linux platform. It’s easy to be impressed by Apple’s Time Machine backup feature. It works in the background, is seamlessly integrated, and when you need to get to restore something whoa.. you’re all of a sudden in space, travelling back in time, bringing something back to the present. There are two key things to this system. First it’s an incremental backup system which allows you to restore from multiple past versions of files that are backed up (the “time travelling”). Second, it’s very easy to use and provides a very impressive experience. So do we have anything like that in the Linux world? Well, for the most part we do, and here’s what we’ve got. NOTE: The link to Rastersoft’s Cronopete seems to have gone missing from the article. Here it is. Backup Your /etc Directory With Daily Cron Task | Here is a simple and easy way to make daily backups of your /etc/ directory! Rsync is an extremely powerful tool and does more than just make copies of your files on your system.